Nearly life-sized silhouettes of musicians are projected on each side of a white cube (3.3m square and 2.5m tall) placed in the center of the hall. On the screen on each wall facing the cube are projected details of objects made of wood, iron, liquid, etc. and those materials vibrate to the sound produced by the musicians who are projected. 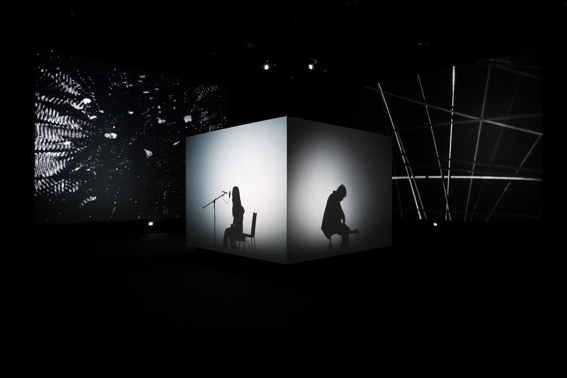 Each of four musicians is projected on a side of the cube. Either of two quartets, A or B, starts performing, and as time passes, players in A and B change places or interfere with each other. Consequently, the performances of A and B are blended or combined at random, and each time a totally new quartet comes to exist. Since visitors can look at only one side of the cube at a time, they can listen to the sounds played by all the players but can’t see their figures all together simultaneously.